Holiday.gr - Chrysopigi, a trip to a myth! Chrysopigi is a small peninsula 10km south of Apollonia. Enjoy the idyllic scenery, the golden beaches and the blue waters. Small coves create sceneries of unique beauty, while the isolated beaches offer visitors the feeling of a private beach. The region is considered one of the most beautiful in the whole island. 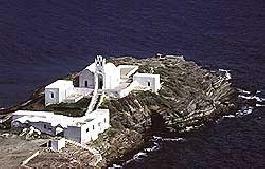 At the edge of the peninsula is located the monastery of Panagia, built in 1650. The local tradition says that the icon of Panagia came to the island out of the sea. In the taverns you will taste the local cuisine of Sifnos. Been to Chrysopigi ? Share your experiences!